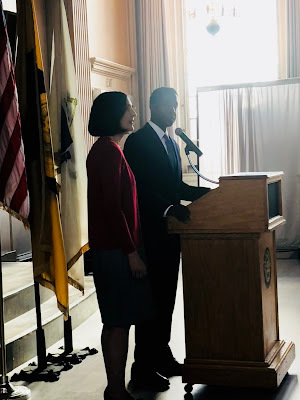 Newton – This morning, Newton Mayor Setti Warren and Mayor-elect Ruthanne Fuller hosted a press availability to discuss the transition of government. As part of the transition process, Mayor-elect Fuller will have office space in City Hall, scheduled meetings with department heads, and access to the regular cross-department meetings that occur on a weekly basis. She will also be provided a comprehensive transition memo, outlining the structure, function, and projects of each department. The seamless continuation of city services, preservation of public safety, and maintenance of the city’s finances are key components to the transition.